CommonWealth Micropub proves that good things do come in small packages. CommonWealth has the best traditional English breakfast in the East Bay. Hours: Tue.-Thu. 4-10:30 p.m., Fri.-Sat. 2-11:30 p.m., Sun. noon-9 p.m. There is no shortage of ways in which the CommonWealth Micropub runs counter to what you might expect from a typical East Bay watering hole. Start with the fact that it is a bar without an actual bar counter — or bartenders, for that matter. Add to that the diminutive size of the space and the fact that there seemed to be a child at every table. 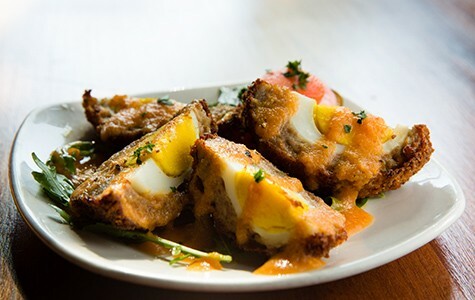 But what made the biggest impressions, even in this golden age of elevated bar food, were the unaffected and notably delicious renditions of British and Scottish pub fare: Yorkshire pudding, Scotch eggs, and probably the best, and most traditional, version of a full English breakfast that you'll find in the East Bay. CommonWealth, which is located in the former Cafe Biere space in Emeryville's Triangle neighborhood, is the second pub for co-owners Ross and Ahna Adair. Though it's not quite five years old, the original Commonwealth Cafe and Pub on Telegraph Avenue is practically an Uptown Oakland institution — a community-gathering place that's part coffee shop, part soccer bar, and full-time haven for enthusiasts of British beer and food. Unlike the original CommonWealth, the Micropub isn't much of a coffee shop or lunchtime sandwich (or "toastie") spot, though it does open for late lunch service — an extended happy hour, basically — on Fridays and Saturdays. Another difference: The beer selection consists almost exclusively of draft beers from local breweries, with nary a Guinness or Old Speckled Hen in sight. It turns out that the micropub designation isn't just a reference to the bar's "micro" size, but rather points to a specific type of beer-centric pub that emerged in Great Britain during the economic downturn of the mid-Aughts, when a growing number of empty retail storefronts were turned into drinking establishments, often without room for the standard bar counter. Like many of its British precursors, CommonWealth Micropub offers table service instead. And while the dining room is, even by generous estimates, a minuscule 300 square feet, the pub actually has a larger and more fully equipped kitchen than the bar in Oakland. As a result, the food offerings are much more ambitious. Ross Adair, the chef at both locations, developed the Emeryville menu with the help of consulting chef Caleb Jones, who worked with him years ago at the now-shuttered B Restaurant in Old Oakland. And while there are a few playful twists, the food at the Micropub doesn't aspire to be anything other than what it is: hearty, comforting dishes that have their origins in the formative years that Adair, a native of Scotland, spent in the United Kingdom. Is there, for instance, a dish that speaks more to the traditional British Sunday supper, or that extracts as much pleasure from just three simple ingredients (eggs, flour, and milk), than Yorkshire pudding? The Micropub's versions, baked in miniature muffin tins, were like little popovers — odd-shaped, eggy-rich, crisp around the edges, and served with a little tub of the savory beer-and-cheese sauce known as rarebit. The Scotch broth, on the other hand, draws more directly on Adair's Scottish heritage. It's a meat and barley stew, essentially, but with cubes of lamb shoulder in place of the more typical beef and a natural sweetness to the broth from long-simmered onions and carrots. Served with buttered toast for dipping, this is homey sustenance that would be perfect on a rainy day. Adair said the smell of it when the broth is simmering on the stove brings him straight back to his grandmother's house when he was a kid. And while the original CommonWealth always had a handful of British-style Indian dishes, the Micropub expands on this theme with housemade samosas and a cauliflower-and-chickpea stew that was like a hybridized chana masala — more tomato-y and less spice-heavy than what you'd find at a traditional curry house, and topped with cubes of fresh-tasting paneer. In general, vegetarians will fare well here, though, with so much else on the menu that was appealing, I never got around to trying the veganized bangers and mash. Even classic CommonWealth dishes that had been honed to a science are given new life at the Micropub. Take, for instance, the puff-pastry-topped chicken potpie, which Adair said is the best-selling dish at the original CommonWealth. At the Micropub, this is served with an extra bonus: a roasted drumstick that sticks up from the middle of the dish like the flag mast for a poultry-filled pirate ship, adding crisp and juicy dark meat to the dish's usual soupy pleasures. 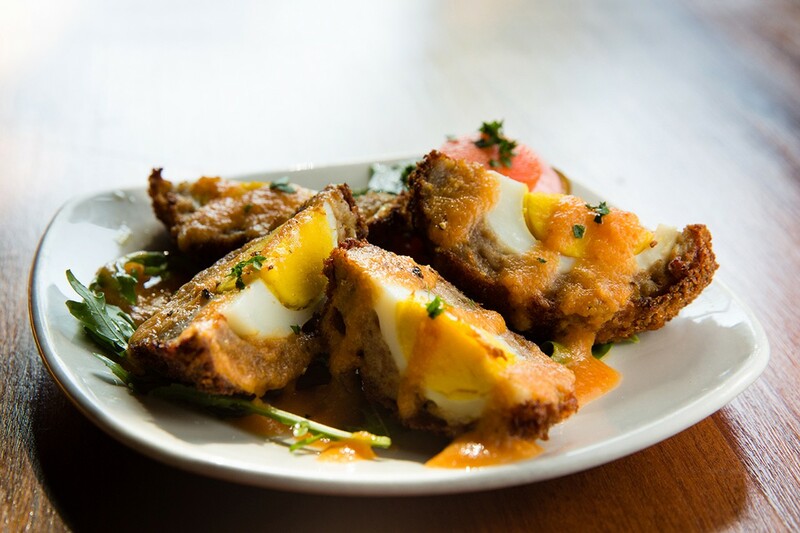 And the sausage-wrapped hard-boiled egg known as the Scotch egg, another signature CommonWealth dish, is deep-fried rather than baked, for maximal crunch. 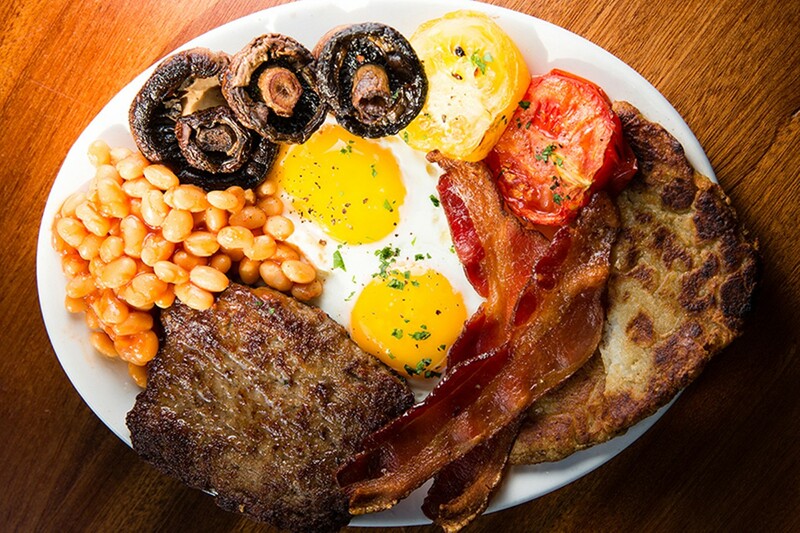 A few weeks ago, the Micropub started serving Sunday brunch, and the restaurant's gut-busting version of a full English breakfast (bacon, Scottish-style sausage, mushrooms, grilled tomatoes, crispy potato cake, two sunny-side-up eggs, and — why mess with a classic — Heinz canned baked beans) is worth a trip all by itself. Every component was cooked just right and seasoned so perfectly — especially the sausage patty, redolent of coriander and nutmeg — that you won't even think about asking for ketchup. In keeping with the British theme, there were also freshly baked scones, served with housemade clotted cream and jam. And the cheddar biscuit brisket "sandwich" was a knife-and-fork behemoth drenched in rarebit, like England's answer to biscuits and gravy, and overloaded with thick slices of brisket that were so well-marbled they seemed as though they were half fat — jiggly, impossibly soft nubs of fat. It was the type of meal, Adair said, that's meant to make you feel lucky if you had no other commitments for the day except to take a nice long nap. In the end, what stood out about the pub wasn't necessarily how different it was from other bars in the area, but rather how familiar and comfortable it felt. Located away from the arms race to open the most on-trend bar in downtown Oakland or Temescal, the Micropub seeks instead to be a humble neighborhood place, located in a community that really had need for a pub, Adair explained. The pub has a low-key, old-fashioned kind of vibe, from its thick curtains and understated Victorian-style wallpaper to the quaintly framed chalkboard beer menu. It's the kind of family-friendly place at which, on any given early afternoon, you're likely to see dogs lounging on the front patio, and more kids than you've ever seen at any other bar, sipping apple juice while their parents nurse a hoppy imperial stout. You could scarcely paint a prettier picture.